Tyrone and Stephanie live and work with their family aboard Mercy Ships, a faith-based charity that is well known for providing free, life-changing surgeries. Pray for the Bartons as they share the gospel with patients. 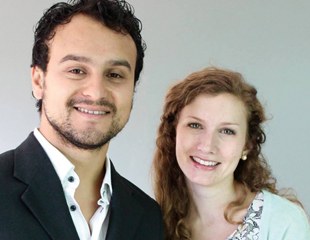 Gonzalo and Rachel Cordova are missionaries and church planters in San Jose, Costa Rica. They serve in the slum community of Pavas by sharing the gospel and teaching the word of God. pray that the people of Pavas would would believe in the saving work of Jesus Christ. Beth Okech is a member of the clinic staff with Kenya Relief who cares for the physical and spiritual needs of Kenyans. They provide quality and affordable care for the most vulnerable. Pray for Beth and her husband Shadrack, as the gospel is shared through the care clinic. Mike and Mary serve the church among a population of approximately 500 million unreached & unengaged people in the Mid-South Region (MSR) of Southeast Asia. Pray for them as they work as Strategy Coordinators and as they lead short-term mission teams to MSR. T is part of a team working in the horn of Africa among an unreached people group. Her primary role is to teach English as she builds relationships with the community. Pray for T as she lives and serves in Africa. K & H and their children live among an unreached people group of South Asians in NYC. They desire to see Jesus worshiped as they love and serve these people. Pray that through evangelism and discipleship, K & H will see growth in gospel communities and churches that multiply. Cru is an inter-demoninational movement of students who are learning what it means to follow Jesus and to share His love with others. They believe that knowing Jesus infuses your college experience and life with purpose, significance, and meaning. Our Cru Partners are Dan and Amy Didriksen. Manna House provides food assistance to those in need, meeting urgent physical needs while also seeking to support mental and emotional growth. The mission of Lincoln Village Ministry is to share the transforming power of the gospel of Christ and to serve through educating, sheltering, comforting, and equipping the Lincoln community. HPRC is a ministry of Choose Life of North Alabama that provides free and confidential help for those facing pregnancy related decision. The goal of Friends of 400 is to address the physical, spiritual, emotional, and relational poverty experienced by children living in inner-city Huntsville. Programs include Cub Scouts, Girls Night, Boy Scouts, Safe Haven/Tutoring, Family Support, Project Great First Day, and Searcy Christmas Party. The Fellowship of Christian Athletes engages coaches and athletes to grow in faith and sport, striving to see the world transformed by Jesus Christ thought influence of coaches and athletes. Our FCA Partners are Pam Chambliss and Russ Daniels. The Downtown Rescue Mission serves the homeless in North Alabama and South Tennessee. Through compassionate care and ministry, they bring people under the power of the gospel so that they may have life.